Kickstarter Tips for Self Publishers! Thanks to Kickstarter, I was able to order 50 copies on my hand to sell at conventions. The title of if also through views off. If you think of setting a fund, don't include the words "help" or "support" in it. My rewards also had a flaw in them. I didn't offer a lot, as you can compare the two. I also made it into a smaller project..but then it set to my original goal! Running it the second time around had me get it funded within only a week! This graph made me so nervous because I've had a few people cancel their pledges and new people come in to pledge more. Yes, backers can cancel their pledges. They can't cancel once the fund has ended. If you have a smart phone like I do, I would suggest adding the Kickstarter app to your phone and email notifications for backup to keep track to who pledges you and what not. It was really helpful for me to keep messaging back my backers right away. Also, make some calculations before hand. Shipping packages ever so slightly hurt my earnings, but I've had some people who donated money to me without asking for rewards..which was a BIG help on my end. But everything is a learning process, right? I hope this helps a bit. If anyone has questions about this, let me know! Maybe someday YOU can make a fund too! 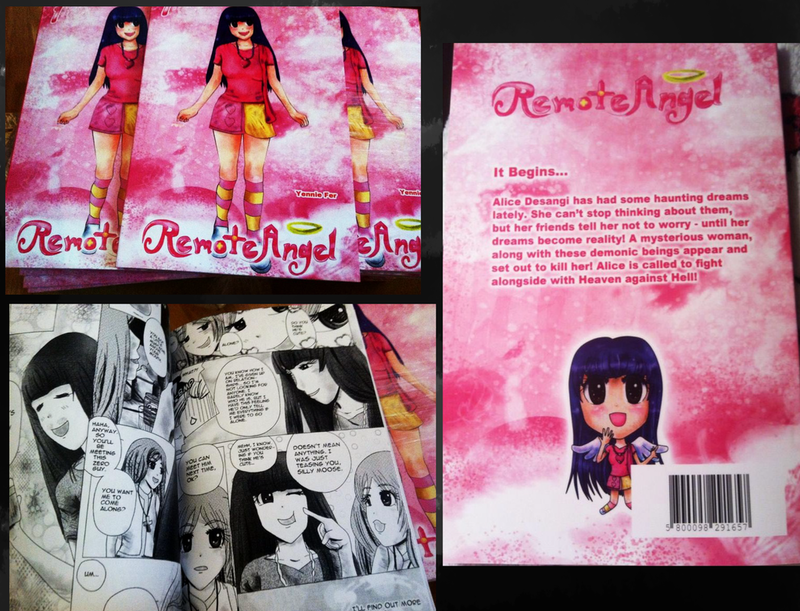 Remote Angel currently also has Volume 2 and perhaps will make another fund in the future! In the meantime, I'm working with AirWin on our newest manga, Crystal Casualty. Thank you for this thoughtful guide to Kickstarter! Maybe more people can post some their tips and advice here as well. Would love to hear from others as well. Thanks I also failed on my first and I am trying to make a comeback. The problem is getting backers that are not friends and family. What tactics/marketing did you do to get more funding? I would love some sort of review to see where I can make this better and more attractive to backers. Hi! Good question! So far, you're off to a good start. I asked around to do some interviews and such. It helped promote my Kickstarter more at the time. There are probably plenty more other websites nowdays. Those are from 2013. I'd look for people who did more recent ones and shoot them an email for an interview! Another word of advice, backers would like to see examples of rewards. Try looking at successful Kickstarters for references in what you can do more for your project. Short and sweet isn't always a good thing and people love to read a bunch more information with more imagery! Also! Posting on Kickstarter related forums does help out! Just explain your story and such. Tweet daily on Twitter! Make it non-spammy..But I'd tweet almost every hour. I'd tweet to those who may be interested in the project and ask people to retweet it. It's an every day process and super time consuming. As long as you dedicate hours of marketing in it, you'll get there! Another thing that helped is posting in a bunch of Google Plus Communities! Try that out. If you have a Facebook, make a Facebook Event to encourage your family/friends to share your Kickstarter! Though I'm sure it must've sucked to have your first Kickstarter fail, I have to say it's encouraging to read that you didn't give up – you tried again, improved what needed improvement, and succeeded! That's awesome! Failure is pretty common, despite all the preparation in the world (we put 100s of hours into ours with many custom images and about 5,000 words). Why do we think it failed? #1: We did not have a big enough number of supporters/subscribers/friends/etc. before starting. Really it takes 100s of close people because many who say they will support ultimately won't. And unless you can get at least 30% of your goal right away, then strangers won't participate either because many only want to back a winning idea that others are already in line for. We thought many people would jump onto what we thought was a savvy campaign and a great book, but alas, very few people got excited even with an amazing video, book cover, and free chapters to read. Really, most just did not seem to care one way or the other. So always make sure you have a lot of people lined up before you even start. Don't expect to get a lot of "surprises". Sure they happen but don't plan on it as part of the core of your campaign in order to reach your goal. We didn't get any supporters for our high end rewards. Another reason why we failed was likely because did not promote the campaign as a "pre-order". The book was done but like Faith mentioned we didn't use the right wording (e.g. "support" rather than "pre-order"). This probably created in some people's minds that the book was not done and it may end up never reaching them. We also had the delivery date too far out. 90 days waiting time to get the rewards is the most you want to do. We also likely set the goal too high and that probably dissuaded people from participating. We also should have had pictures of hard copy books sitting on a table top so people could see the final product. Many people have gotten taken in the past, never receiving any rewards, so many are shy now about supporting other projects. Seeing an end result ready to go would probably alleviate some of those fears. Another issue was getting people to spread the word about the campaign. So many did not want to, we don't know why. Maybe because of all the issues mentioned above regarding our campaign. It did not look "strong" enough to them so they were shy about telling others. We did do podcasts/radio/website interviews and advertised like crazy but nothing really seemed to work. Another issue was likely because we used an off brand name like PubSlush rather than Kickstarter and people were not familiar with that website. Friends were asking if their credit card information would be protected or not because there was not the brand recognition with such a new site. When we do another campaign we will definitely use Kickstarter rather than anyone else. The end result was that the campaign came to an abrupt halt three weeks early because PubSlush suddenly went bankrupt. All the supporters money we worked so hard to raise was refunded. It was emotionally very devastating to work on preparing a campaign over three months, spending 100s of hours, and then it falling apart like that. The good news is because the website no longer exists, no one can ever see the failed campaign, whereas at Kickstarter people can do that. Afterwards we quit doing anything creative for six months. There is a lot of emotion and hard work that goes into a campaign and creators who are thinking about doing one should prepare themselves for such. Someday we will try again, but not until we have 1000s upon 1000s of subscribers who want a pre-order hard copy of our manga . . . and gaining a following like that could literally take years to build. . . if ever. Thank you very much! Yeah, it did get me bummed at first..But I learned a whole lot from the experience. Even going the second time, I learned even more for future Kickstarters! Very informative and you are correct. It's good to recognize mistakes on funding experiences and it does actually help to fail since failure does bring a whole lot of learning on what to do for the next time. We do hope things work out whenever you do get your fund up again! Kickstarter is growing massively and most of my supporters actually came from the website itself so don't give up! New fans will appear and for other past supporters may come to try to fund you again. Good luck! Succeeded in launching a Kickstarter project on 'Angular 2' by raising the backers count. Now once again coming up with an idea of launching a project on Stack Bundle Course. Now its the time we need your hands of support. So back us on our project to raise the funding amount as well backers count. Thank you so much for the tip. I'm also am one of the thousand and thousand of people that want to create a funding using Kickstarter. Im glad that people share their experiences with other with do and don'ts! !